- بیش از نیمی از مشتریان برای بار دوم و بیشتر خرید داشته‌اند و این مایه افتخار ماست. - با توجه به مشکلات سیستم «پرداخت هنگام تحویل»، این نوع پست در فروشگاه غیرفعال شد. - هزینه ارسال سفارش‌های بیش از ۱۰۰ هزار تومان به عهده فروشگاه خواهد بود. - تمام محصولات شامل گارانتی هستند و در صورت وجود هر نوع ایراد، دوباره ارسال خواهند شد. این روزها طرفداران ایده‌ی A.J Hoge روز به روز در حال افزایش هستند. هگ معتقد است دوران Listen and repeat و Listen and practice به سر آمده! دوران، دوران Listen and Answer است؛ بشنوید و پاسخ دهید. به خاطر همین ایده، او مجموعه‌ای از کلیپ‌های صوتی را آماده کرده است و بر اساس آن‌ها سؤالاتی را مطرح می‌کند و از شما می‌خواهد پاسخ آن‌ها را بگویید. موضوعات انتخابی، متناسب با پرکاربردترین موضوعات در هر زبان هستند و به شما مفاهیم و لغات زیادی را منتقل می‌کند. این دو DVD شامل سری کامل Effortless English (که خود شامل سه سطح است)، سری کامل Learn Real English Conversations و سری کامل Bonus For Power English (که به تازگی منتشر شده است) می‌باشد. در کنار این مجموعه، یک مجموعه‌ی ارزشمند دیگر نیز جهت تصحیح تلفظ شما قرار داده شده است که مطمئناً برایتان جالب خواهد بود. توضیحات کامل در مورد این مجموعه در انتهای این مطلب آمده است. جواب: این دفترچه‌ها در حقیقت شامل متن چاپی تمامی کلیپ‌های صوتی هستند که ما متن تایپ شده‌ی آن (pdf آن‌ها) را بر روی DVD قرار داده‌ایم چرا که اگر آن‌ها هم اضافه می‌شد، هزینه محصول بیش از 20 هزار تومان می‌شد. هر بخشی را که خواستید، می‌توانید پرینت بگیرید. ضمن اینکه از نظر چک کردن در دیکشنری و پرینت گرفتن بسیار بهتر خواهد بود. جواب: بله، تمام محصولاتی که بر روی سایت ایشان قابل خرید است بر روی این دو DVD قرار گرفته است. این ویدئوها بیشتر جنبه تمرین و تنوع دارد. به طور مثال آقای هوگ در یکی از آن‌ها در مورد یک میدان در شهرشان صحبت می‌کند یا یک مکان خاص. اگر این ویدئوها و اضافات جانبی را نیاز دارید، می‌توانید از بالای پنجره از بخش «اضافات» این دی.وی.دی را نیز به این پکیج اضافه کنید. Effortless English uses the best research in the world, from top experts such as: Dr. Stephen Krashen, Dr. James Asher, Dr. J. Marvin Brown, Dr. Ashley Hastings, Dr. Brenda Murphy, David Long and Blaine Ray. The research is clear-- students who use Effortless English are better speakers than students who use textbooks, grammar, and self-study only. In every country, in every possible situation, students who learn with Effortless English methods always win against students who use old methods. * The incredible Way to Learn Vocabulary and Grammar Without Study-- Listen & Answer Mini-Stories. These lessons are simple and amazing. You learn grammar and vocabulary without study or memorizing. * The Deep Learning method that helps members use English automatically. No more translating. No more thinking. The words just come out. * The way to learn English in a relaxing way by listening to real English articles about interesting topics. * The way to avoid grammar study and instead learn grammar like children-- naturally. * How my best students learn, how they study,-- and how you can learn English faster. * How to raise your iBT TOEFL speaking and listening scores 20%, 30%, or even 40%. * Lessons that help you learn English 4X faster. Grammar is not the key to speaking English easily, and fast. The best English learners are children, of course. Why? Because they don’t study grammar and they don’t learn from textbooks. They use the Effortless English Rules. This "Effortless” method is very powerful. Very, very powerful! When you use the Effortless Method, you learn excellent pronunciation. You learn vocabulary quickly and easily. You understand grammar automatically - without memorizing it. You don't translate when you listen or speak. You speak English fast, and easily. You feel strong and relaxed when you speak English. When you use Effortless English lessons, you become a member of a community. You use the Effortless English lessons, you write to other members, you make friends all over the world, and you learn to speak English easily. * The incredible Way to Learn Vocabulary and Grammar Without Study- Listen & Answer Mini-Stories. These lessons are simple and amazing. You learn grammar and vocabulary without study or memorizing. * The way to avoid grammar study and instead learn grammar like children - naturally. * How my best students learn, how they study, - and how you can learn English faster. * How to meet other English speakers and talk with them. These are listening lessons, not reading lessons. You learn new vocabulary by listening to me discuss new phrases. You do not study lists in a textbook. You learn phrases by listening. You download these lessons and put them on your computer or iPod. You listen to them anywhere. Next, I use the powerful Listen & Answer method to teach you English automatically. You do not read the story, you listen to it many times and answer questions. This is the most powerful English lesson you will ever have. You learn vocabulary, grammar, and pronunciation in a completely natural way. You answer questions fast-- and automatically. Point of View lessons are next, and they are amazing. I teach you English grammar, but you do not study grammar rules. You learn English grammar naturally, like a native speaker. You don’t study grammar rules-- you learn grammar naturally, like a child. Next are real audio articles. These are real English articles about interesting topics. No text- books, and no textbook English. You improve your listening, vocabulary, and speaking by listening to these articles. It is automatic. Flow English Lessons are the perfect addition to the Effortless English Lessons. Flow English Lessons focus mostly on deep learning of the past tense and the most common idioms. Flow English Lessons are also perfect for intermediate level learners who want to speak English faster, more easily, and more quickly. Together, Flow English and Effortless English Lessons give you the perfect combination. You learn the most common idioms deeply. You learn the past tense deeply. You speak even faster. Flow English gives you the most common spoken English. 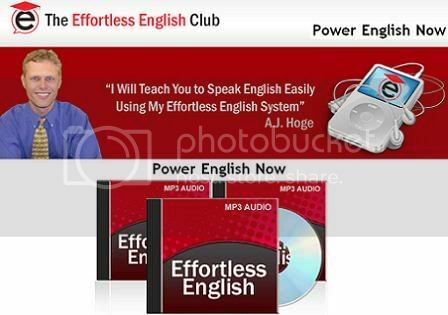 Effortless English builds more-- giving you more advanced speaking and listening. Of course, Flow English uses the same great system as Effortless English. You get the same great Vocabulary Lessons. You get the same great Text and Audio Stories. You get the same great Listen & Respond Stories. You get the same great Commentaries. Imagine yourself in a coffee shop, talking with an American. You are relaxed and smiling because you are communicating easily. The words come out quickly. You feel no stress, no doubt, no worry. You are a strong and respected English speaker. Your friends are surprised because you are speaking English so well. You can do it. These are not normal, boring Business English Lessons. "Success" teaches you how to improve your career, how to create a successful business, and how to make and save more money. * 8 complete lesson sets. Designed as a self-teaching fluency-building phonics program, "Master Spoken English" provides comprehensive training via speech exercises and drills. Both fluent native speakers of English as well as those with basic English skills can watch this program to increase resonance, clarity, fluency, and expressiveness. The program provides a color-coded phonic system to aid viewers in the exercises. Word lists precede connected speech, with practice scenes (from actual movies) comprising the third and final level of training. The producers' skill and attention to details such as lighting, composition, and camera work create a program that is useful, informative, and visually pleasing. This is a fine work. Recommended. # in relaxed settings, for anyone who wants more command of spoken English. # Comprehensive Training in speech exercises and pronunciation drills. # A Phonic System that therapeutically realizes vocal energy and explores the musical values of speech. # Dozens of Practice Scenes from two feature films with all the text on screen color-coded to the phonic system. # All Original Animation detailing lip and tongue articulation, and points of vibration. All Original Music that amplifies the phonic properties of the course. if you've found any dead links (as in links which no longer go to the place they should be going to)then tell me and i'll fix it and then let you know when I have, so you can find what you wanted again. The Real English Conversation Pack builds on the Effortless English system. In these lessons, you get the same great Effortless English system you love. Each lesson set contains a real conversation between native speakers. No actors. * Text Transcripts for EVERYTHING! * The real, casual conversation that native English speakers use everyday with each other. This is not formal English. This is the real English that real people use. * A huge number of common idioms - the slang you can’t find in a dictionary or textbook. * Real conversations about real topics – the topics that real people talk about in their daily lives. * How to automatically speak like a native speaker. * How to never be confused by native speakers again. * How to learn grammar effortlessly, without studying grammar rules. * How to learn vocabulary 3-4 times faster, without memorizing. * How to improve your TOEFL speaking score. * How native speakers really pronounce words and phrases- it’s not like textbooks and it’s not like CNN. International students can speak English fluently using a new set of lessons from Effortless English. The lessons, titled "Power English Lessons", are designed to help students speak English faster. "Fluency is our number one goal at Effortless English", states A.J. Hoge, Director of the company. The new lessons place high importance on speed. Mr. Hoge states, "Speed is the big difference between written and spoken English. To speak English fluently, students must understand and speak fast". The new lessons, therefore, use special techniques to increase the speed of students' listening comprehension and speech.The company is providing a 6 month guarantee with the lessons, guaranteeing that students will speak English fluently after daily use of the lessons for 6 months or less.